US-based packaging firm Sonoco has launched playful packaging for kids’ drink Jumbotonic. 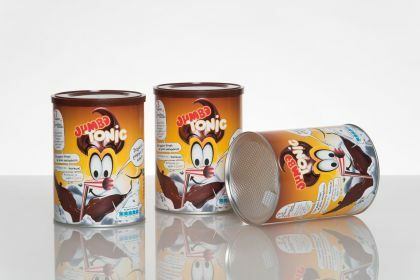 Previously in 2016, Sonoco launched a chocolate drink powder, Jumbotonic Kid Instant Choco, with attractive packaging for kids. The label on the new packaging will display a playful cartoon face splashing in a pool of milk and chocolate. The container will also have a red and white retro-style straw. The Sealed Safe can of Sonoco, which has 99mm diameter and a height of 140 mm, will be used by Gialousis. The can secures its contents from humidity with an aluminium inner liner, a metal end, and a Sealed Safe membrane. The aroma nad consistency of the contents will be retained with the snap lid of the can, which can be reclosed. Sonoco Europe vice president and general manager Sean Cairns said: “Instead of being solely product packaging, Gialousis’ rigid paper containers become a colourful addition to living environments such as kitchens or kids’ play corners. Gialousis, established in 2007, chose Sonoco as its packaging solutions provider in 2011. The powder beverage firm sells its products in 1kg pouches and large-diameter composite cans. In 2015, Sonoco provided Gialousis with premium packaging for chocolate mixes with spices, fruits, and nuts. Sonoco, founded in 2009 and headquartered in South Carolina, specializes in consumer packaging, industrial products, protective packaging, and displays and packaging supply chain services. Image: New packaging solution for Gialousis and Jumbo S.A. Photo:Courtesy of Sonoco Europe.